We will be releasing a series of Artifact Reports on significant artifacts found over the years to build our new Artifact Report Archive. We will post links to the articles here on the Latest News page too, as they become available. 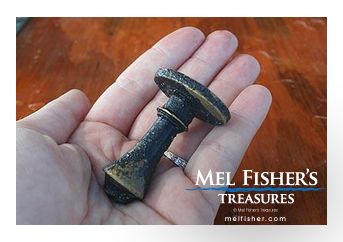 In September 2011 Captain Andy Matroci and the crew of the J.B. Magruder were continuing to develop an area on the northern end of the Northwest artifact scatter trail of the Nuestra Senora de Atocha, 1622. This same area has produced some intriguing finds over the past months including an emerald ring that has been evaluated at over 1 million dollars and a gold rosary of unique design. While these artifacts are fantastic, their importance is overshadowed by the find of a seemingly less valuable bronze seal. Bronze seals such as these were used by nobility, church and government functionaries for impressing designs onto official papers. Hot “sealing wax” would be applied to the document then the seal would be used to impress the image into the wax. It was, much as today, a way of ensuring the authenticity of the document. When looking at the seal at least two things need to be kept in mind, (1) This is a reverse image, in that once the seal is impressed in hot sealing wax the resultant image would be a mirror view of what can be seen on the seal, and (2) The seal is obviously an image of an heraldic coat of arms, usually associated with a noble family. A number of possibilities presented themselves. The most obvious was that this was the coat of arms of one of the wealthy passengers or officers on board the vessel, or that this was part of a package of goods belonging to a person of importance in the New World who had died and the important effects were being sent back to his family in Spain (a not unusual occurrence). Starting with the theory encapsulated in what has become known as “Occam’s Razor” i.e. that the simplest explanation is usually the most correct. 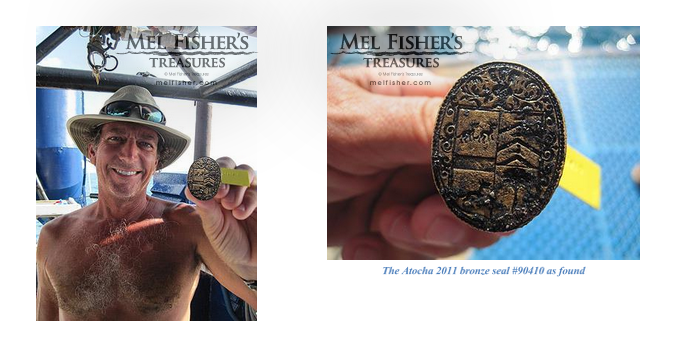 We collaborated with Corey Malcolm the archaeologist of the Mel fisher Maritime Heritage Society. These good folks help to keep the collection of research on the Atocha intact for future generations. He was kind enough to send the list of those lost aboard the galleons Atocha and Margarita, gleaned from contemporary sources. We contacted various experts in the Heraldry of that period and we were thrilled with the news that came back. 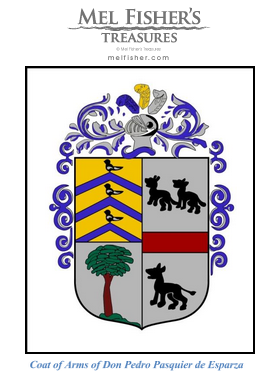 The Coat of Arms belonged to Don Pedro Pasquier de Esparza, Almirante of the 1622 Tierra Firma Fleet. The name Pasquier is of French origin, Don Pedro comes from a very old and noble family of Tudela, (Navarra). One needs to keep in mind that boarders and allegiances were a changeable situation then as they are now. We know that the family was living there since the middle Ages. In the middle of the XVI century there were several Pasquier’s in Navarra and almost surely they were his relatives. In 1617, Don Pedro Pasquier de Esparza received the title of Caballero de la Orden de Calatrava, an order of military knighthood where they mentioned his grandfather’s names. 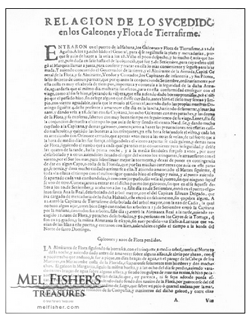 By 1621, the King most likely made a Royal Decree appointing him as the “Almirante” of the Tierra Firme Fleet of 1622. In September of that year, Don Pedro and the other 264 people on board the Atocha sailed to their fate. Nearly 400 years later we have been able to research the various complexities of Spanish heraldry and we have switched the image and added the correct colors to fully appreciate the Coat of Arms of Don Pedro Pasquire de Esparza Admiral of the 1622 Tierra Firma Fleet.